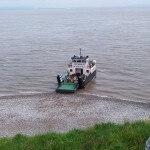 On 21st July 2012 I found myself, along with Chloe M0GEJ, on Flat Holm Island. Flat Holm is a small island in the Bristol Channel and is part of the EU-124 island group for IOTA. 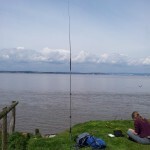 As we would be on the island for around 7 hours I thought I would take along the Elecraft KX1 and a vertical antenna and try to make some QSOs as MW0PCB/P as Flat Holm is in Wales. 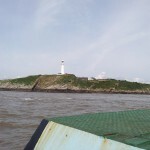 Flat Holm Island, a picture from the boat. The Westward Ho sails from Weston-Super-Mare and takes a little over an hour to get to Flat Holm. 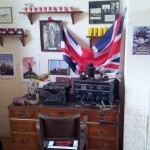 It was from Flat Holm that Marconi first sent radio signals across water, there is a small display in the museum about this. The ATX Walkabout antenna with mast section from Sandpiper. 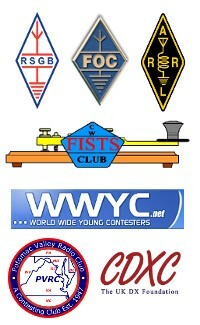 Chloe M0GEJ is on the air to the right. 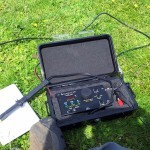 The Elecraft KX1, truly a shack in a box. In this case the box is a small Peli case. Sadly for a number of reasons I only managed a single QSO on 20m CW in the end, before falling asleep for an hour or so before having to pack up and wander back for the boat. A couple of nodes on the Reverse Beacon Network had picked up my CQ calls though so I was getting out. Having made an attempt at a backpack visit I now have learned some interesting lessons which will hopefully lead to a more successful trip back to Flat Holm for next time.